* Saving the inner core of Hertford from inappropriate re-development in the 1970s. 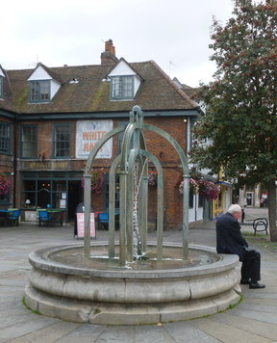 * Commissioning, maintaining, and operating the Salisbury Square fountain, with a bequest from a local benefactor, the late Mrs Medlock. * Bulb and tree planting on Gascoyne Way roundabouts and along the A414. * Producing the ‘Green Fingers’ report on the importance of our river valleys and persuading the Local Authority to incorporate its principles into planning policy. 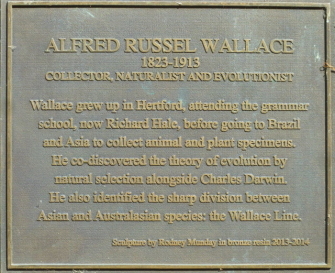 * Commissioning the Alfred Russel Wallace memorial on a wall of Hertford Theatre, to commemorate the work of Wallace, who was a Hertford resident and contemporary of Charles Darwin. 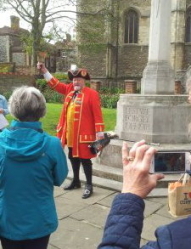 This was done in partnership with East Herts and Hertford Town Councils. See photographs on this page. * Working with Hertford Town Council to institute a ‘blue plaques’ scheme to identify notable heritage buildings in Hertford. * Taking the lead in establishing the cycle route from Hertford to Ware along the river. * Contributing to the costs of local projects, such as the railings and gate for the community garden at St Leonard’s. * Taking part in Public Inquiries, such as Panshanger Park, Archer’s Spring and Sainsbury’s. * Co-operation with other local and national groups having similar or complementary interests. We are anxious to continue such activities in the future but can only do so if more people come forward to help. 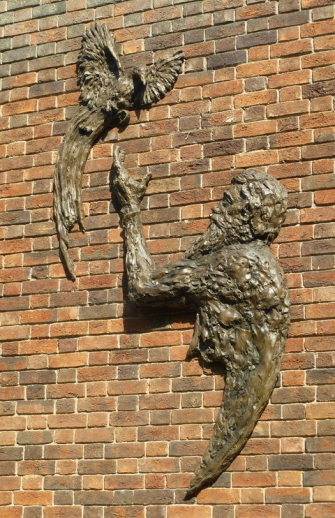 Will you lend a hand? If so, click here. Or to join, click here. * Campaigning for the improvement of public transport in the area, for the improvement of walking and cycling routes, for a reduction in the dominance of vehicular traffic in the town, and for the improvement of air quality. * Arranging lectures by specialists in conservation, architecture and planning, and other matters of interest to members. * Reviewing local authority planning policies which affect Hertford and lobbying from a position of experience, competence and expertise. * Reviewing planning applications and making representations which encourage quality design and sensitivity for the environment. * Organising an Awards scheme to endorse with the approval of the community those developments which are well done, sensitive, progressive and enhance the environment. Awards are made every 5 or so years, most recently in 2016. * Producing a regular newsletter. * Visits to places of particular interest, locally and further away – houses, gardens and social gatherings, sometimes in places of interest not normally open to the public. * Making representations on issues such as public transport, waste disposal and gravel extraction. EVENTS Click here to see our events list. Details of next year's events will be published at the end of this year. See photos taken during a Rochester coach trip and a garden party. 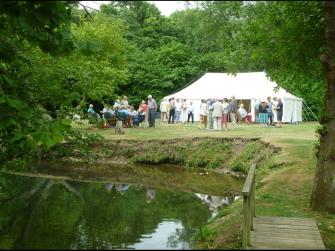 Please send us photos of the 2018 Roxford garden party and Sudbury coach trip. PLANNING REVIEWS The Society reviews and comments on many planning applications for sites in and around Hertford, and on proposed planning strategies for the area. Comments have also been made on proposed changes to local transport and education. Click here to see comments made on major issues. Summaries can be found in the Newsletter. AWARDS Every 5 or so years completed new building developments or extensions are assessed by a panel, leading to a number of Awards presented at a formal ceremony. The 2016 Awards are described in this Newsletter. CONSTITUTION The Society holds an Annual General Meeting to which the Committee and Treasurer report for the previous year, and at which the Chair, Treasurer, and some Committee members are elected. 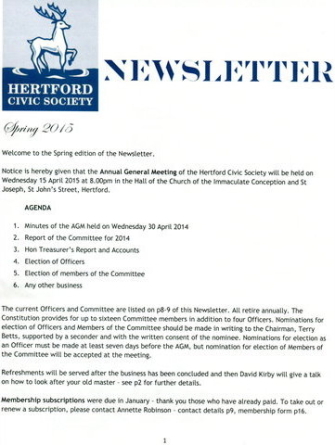 Advance notice of the AGM, the reports, and minutes of the last AGM are printed in the members’ Newsletter. The Society is a registered charity (266111) with written constitution and policies. CONTACT US If you wish to send a message to a committee member, or make any other enquiry, please complete this form.